ICS serves the needs of businesses in virtually every type of industry: Does your company utilize technology to manage business operations, accept payments, organize data, communicate with customers, or leverage other computer-based applications? If so, ICS can provide your organization with IT support. We've worked with businesses across all major industries, including medical practices, law firms, insurance agencies, manufacturing companies, nonprofit organizations, skilled-trades businesses, and more! ICS has expertise in working with all operating systems: Whether your company uses a Windows, Linux, Android, or Mac Apple operating system, we have the experience and knowledge to troubleshoot, manage, and maintain it. Want to migrate to a new OS platform or upgrade to a new version of your current OS? We can help with that, too. ICS's team has multiple advanced certifications: We currently hold three Microsoft Silver competencies as hosting, datacenter, and midmarket-solution providers. In addition, our Microsoft Small Business Specialist certification shows that we have proven to possess the technical and consulting ability required to deliver high-value, strategic solutions for small businesses. We also hold a CompTIA MSP Partners Trustmark, which shows that we've demonstrated a commitment to providing high-quality managed IT services in a competent and ethical manner. ICS has top technology partnerships We have working relationships with the most recognized names in the industry, including many of the major players in the software, security, networking, hardware, and communications solutions arenas. Our technology partners include Microsoft, Dell, CompTIA, Cisco, Intuit, Symantec, NETGEAR, and Linksys, just to name a few. ICS can meet all your computer support needs in Bergen County: Our products, services, and solutions can meet all your business' IT needs, including managed security, backup, and disaster recovery, network design, deployment, and management, strategic planning, cloud computing, software and hardware deployments and management, communications-systems deployments and management, mobile-device management, server management, helpdesk support, and much more. 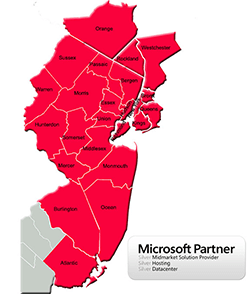 These fast facts are just a sampling of the reasons businesses turn to us for Bergen County Computer Support. Contact us today to learn more and schedule your complimentary, on-site technology assessment!